So, I forked out some hard-earned cash. Well half of my tax refund if I’m being totally truthful though in its way hard-earned. I always spend half of my tax refund on something frivolous because I like to imagine a bureaucrat in the bowels of the Tax Office grinding their teeth at the injustice of having had to give me money only for me to go and wantonly waste it. Petty, I know, but highly satisfactory. For those who care about such things the device I chose is a Sony PRS-650 though the object itself is not the point of this particular post. My aim for now is to fess up (to those who remember my recent ramble) and to start documenting my journey from vaguely interested observer to eager but geographically frustrated participant in the eReader conversation. The next instalment of my eAdventure will provide full details of my garage epiphany. *in this instance other = anywhere outside the US and UK. I don’t have first hand experience of being an avid reader anywhere other than in Oz but from what I’ve heard from readers and bloggers in Europe and Asia they suffer similar exorbitant pricing, lack of availability of titles and generally being treated like semi-literate pond scum. Great post. I’m just about to buy an eReader myself after being mostly apathetic towards them but now I’ve discovered having one might be quite useful (although I am taking the plunge and buying a Kindle). Being a fellow Aussie, I’m sure to encounter the phrase ‘sorry this item is not available to your country’. I’ll be following your adventure, I’m interested to see how the Sony works out for you! Thank you for sharing your considerations with us. I have no inclination to buy an ereader yet as I buy many of my books second-hand. (Not good for the authors, but if they write well, I can at least give them a positive review). But now I have sold one story that will be published in an ebook, and if this continues, I am not sure I will go on reading them as pdf-files on my computer screen. And as I am hardly ´the next Stieg Larsson´ (though everybody else in Scandinavia seems to be), ebooks may be my way of getting my stories out in the future. So who knows, in the next year or two I may have to research into Kindle for Danes. I’ve been an ebook only type of reader for three or four years now. Another reader friend got me started. It’s been a bumpy road for me. In fact, I just got an email from WH Smith ebooks telling me that if my billing info is outside the UK then I will no longer be a customer. It’s frustrating to want to buy books yet they are unavailable to us in the US or say Australia for you but available everywhere else. Makes zero sense to me. DRM is the biggest headache though. But I’ve learned to strip my ebooks so that they are completely mine. I have a Sony PRS 505 and I love reading on it. I also read on my phone but not as much as I used to. I think ebooks are worth the hassle and trouble. I like that I can take my library of books with me everywhere. I like instant gratification. I love reading ebooks period and so, I say, welcome and be prepared for an interesting adventure. Congratulations Bernadette! 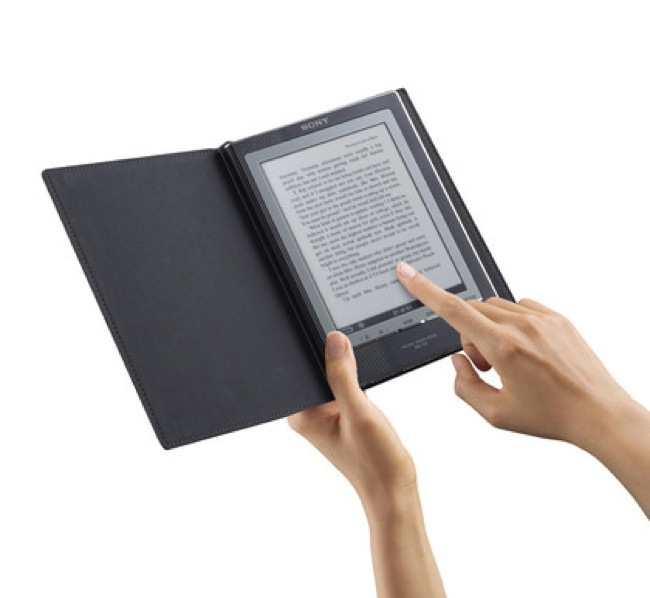 As I love gadgets, I am itching to get one e-reader for a long time. Until the titles are as cheap as paper books, I don’t think I’ll be jumping on the bandwagon. Why should I be punished for paying more when I actually save the publishers cost? It doesn’t make sense to me. I am pretty much decided that I am going to buy a Sony as well, so I will be interested to hear more about what you think and how you find using it. Thanks all for your comments, I already like the gadget itself and am finding it quite strange to realise how little things matter – like being able to read one-handed! I saw an ebook reader (not sure what brand exactly) in my local Borders last week. Piqued my interest, I must admit! It is definitely a solution to heavy books, expensive paperbacks and the utter lack of space on my shelves. Congratulations on your ebook reader! I, alas, am a Luddite, I guess, forever saddled with a real, not virtual book, at my side or in my bag, wherever I go, in love with libraries and bookstores, where I spend many “vacation” afternoon breaks. Look forward to reading your virtual adventures in reading. And, by the way, you earned every bit of the money in your tax refund. It’s not a gift. And you deserve to buy whatever the heck you want, even spending the entire refund on “frivolous” items which enhance your life. I recieved a Sony PRS 505 as a gift from a friend and I am loving it. It doesn’t have annotation features, but I can live with that. I have found the best place to download freebooks is direct from Gutenberg. As for buying new ebooks, I am shocked to see some ebooks going for as much as a hardback, price gouging if you ask me. I have bought one new book via the Book depository because I couldn’t get the Borders or Angus and Robertson sites to work for me (spent two hours trying to workout why i couldn’t download, customer service non existent).